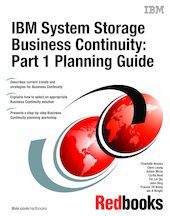 This IBM Redbooks publication introduces the importance of Business Continuity in today's IT environments. It provides a comprehensive guide to planning for IT Business Continuity and can help you design and select an IT Business Continuity solution that is right for your business environment. We discuss the concepts, procedures, and solution selection for Business Continuity in detail, including the essential set of IT Business Continuity requirements that you need to identify a solution. We also present a rigorous Business Continuity Solution Selection Methodology that includes a sample Business Continuity workshop with step-by-step instructions in defining requirements. This book is meant as a central resource book for IT Business Continuity planning and design. The companion title to this book, IBM System Storage Business Continuity: Part 2 Solutions Guide, SG24-6548, describes detailed product solutions in the System Storage Resiliency Portfolio.